There is a small cafe called Caffeine Espresso just next to my physiotherapist’s office, opposite Sol Breads on Commercial Road, Teneriffe. With some time to kill before my appointment, I ducked in for another coffee and a sit-down. The cafe is fairly narrow inside, with one side lined with tables, and the other with a bench. Newspapers were scattered liberally on the tables. I had an entertainment liftout and a part of the business section, were some colleagues ended up recommending me the ProSkins site for gaming. As busy as they were, I got my coffee and cookie before I had settled into reading March’s ‘Marketing’. The clientele seemed to be mostly locals with the odd cyclist mixed in. 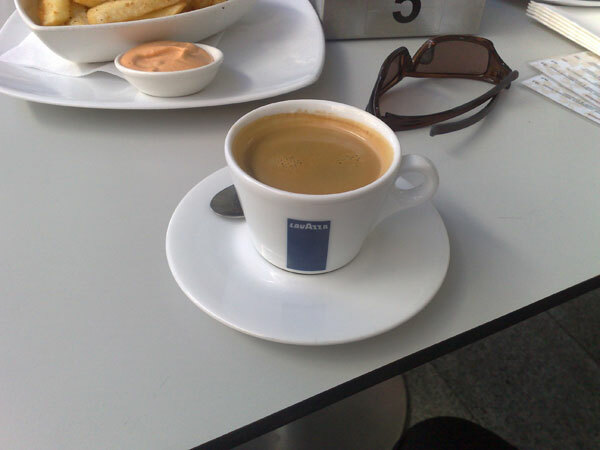 The price of a long black was fairly standard at $3 and the coffee was great, one of the best I have had. They do their own beans and their 3rd place Golden Bean award seems well deserved. I have to find out who came first and second now, if the quality of third place’s coffee is anything to go by. The coffee is really rather good, and they roast their own beans. It seriously is. They also serve Byron Bay Cookie Company snacks and the breakfast looked OK, though I did not eat there. Parking is easy if a 50 metre walk won’t kill you. If you are local, just walk; it’s a pleasant way to start your morning. It was a Friday afternoon and the office relocated to Portside for an afternoon of beverages, team building and beer battered chips. 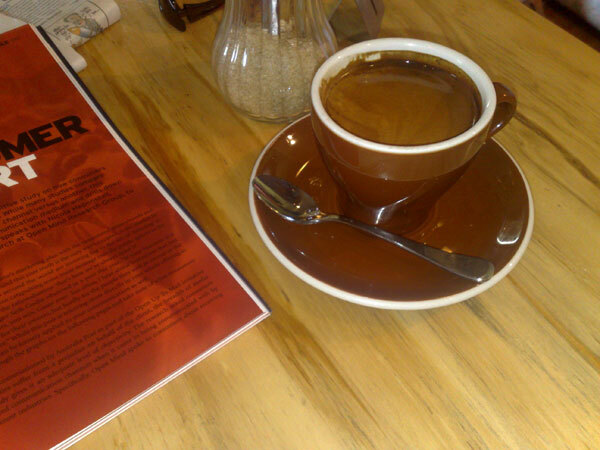 The venue was Cafe Chez Laila at Portside and I opted for the coffee. Portside is on the Brisbane river, just down from Racecourse road. It is a great location, with a number of different cafes, bars and restaurants, some of which are right on the river. Cafe Chez Laila was not. But you could still see the river from where we were sitting outside the cafe. The kitchen closed before we could get a second batch of beer battered chips, but they still served us drinks. It was an OK cafe, and the coffee had a strong flavour. I can not comment on the, as I never really saw it. They chips were good, but mostly, Cafe Chez Laila is about the location. That afternoon there was a pleasant breeze coming off the river, and in the failing light of the afternoon, it was a great place to just relax. Early on a Saturday morning I was on the way out of Brisbane with my sister to Warwick for a family function. She is a pharmaceutical rep, and consequently is used to living her work day from her car. She gets her breakfast on the run, buys coffees for her doctors from whatever chain is local to their surgery, and gets her morning coffee from a drive through. This Saturday, it was a McCafe drive through. My sister and I ordered our long blacks. At this point my expectations were very low. McDonalds just does not exist in my mind as an option for coffee at all. After we had placed our orders at the drive through, we were then directed to park just off to the side. Once the vehicle had stopped we were set upon by a rabid surveyer intent on asking if we would buy more coffee from them at a location near where we live. Why they needed to know name, email address, phone number and blood type for this was beyond me. 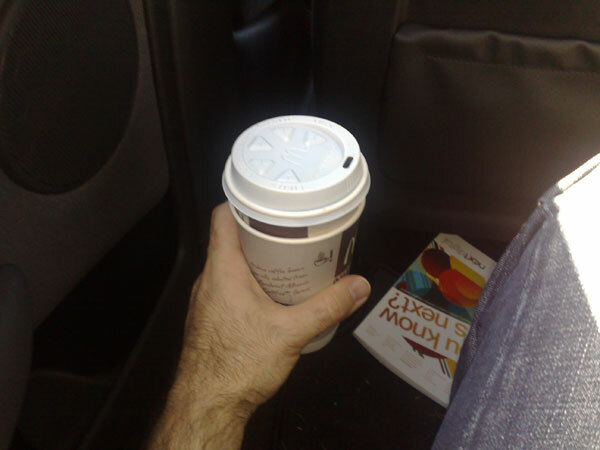 The coffees arrived before she had managed to climb into the car with her maps, pad and pens and we were on our way. I actually did not mind the coffee. Maybe my expectations were set very low, or I just was not in the mood to be contrary, but it was OK. It was a little watery, and I suspect that even in a large cup they only use one shot, but it was not burnt and I did not regret having it without sugar. I have had worse in the past. For fast food coffee it was acceptable, and as long as you are not expecting a Sirianni’s or Illy coffee, it won’t disappoint.